There are many good themes to choose from and everybody has their favorite. 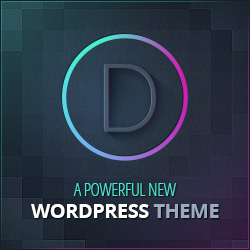 My favorite is by Elegant Themes, called DIVI. It’s a very versatile them that you can customize very easily, there are many mods & tutorials for getting the most out of DIVI. One of the best tutorial and information blogs is done by Geno Quiroz, he has an extensive list of tutorials, code snippets, CSS & more. Thank You Geno! WordPress is easily customized using themes, plugins, shortcodes and custom coding. The selection of plugins and other means of customizing a WordPress site is virtually endless. There is one plugin that stands out in it’s ability to modify the appearance of a WordPress site. The “Widget Options” plugin facilitates altering the usage of widgets in a vast amount of ways. Using the “Widget Options” plugin makes it very easy to alter when and where a given widget will show up and to whom it will be shown to. You can control widgets by the type device being viewed with, by the time or date being viewed and more. Each aspect of the widget can be customized including altering appearance, content and who can see it. For instance if you have a special offer that you only want to be seen for a few hours or days, you can set that up using this plugin. You can also have it so only certain user roles can see whatever you have in the widget. The appearance can be customized also including adding background images to the widget. The list of variables that can be altered is extensive and rather than try and list it all here, I will just refer you to the developers site for the complete story. If you want to get the most out of your site, the “Widget Options” plugin is a must have! Get the complete information here! A very good source for diagnosing WordPress problems is provided by Codeable: they have a wealth of information for WordPress developers. Click on the image below to view the complete article. There are many ways to get traffic to your site. Among them are free traffic builders, free Search engine submissions and realterd services are a popular way to start getting traffic. I will be adding more ways to get traffic, so check back often! View the video for instructions on how to install WordPress using your cpanel. Allow time for the video to fully load before playing. The Widget Options plugin can’t be beat for controlling your widgets. If you aren’t using Widget Options you aren’t utilizing your widgets to their full potential. Get Widget Options now!